In a slew of reports published in the US last year, the number of women working in the tech industry was only 30%, despite the fact that women account for 59% of the total workforce. In the face of the these challenges, SweetIQ surpasses the industry’s average by 15%. To celebrate International Women’s Day, we’ve decided to introduce a few of the exceptional women who push our company further every day. To read previous posts in this series, click here. Meet Liz McConomy, SweetIQ’s Marketing Director. Liz got her start at the company a year ago, and has been integral to multiple departments on a day-to-day basis, as well as on a larger scale by applying her strategic outlook to ensuring projects always tie back to the overarching goals of the company. Liz sat down with our Content Strategist Colleen McNamara to talk about how she got her start in this industry, the qualities that make a strong leader, and how we can support women in tech in order to propel them to new heights. 1. Tell us a little bit about your background: where are you from, and where did you go to school? I was born and raised in Montreal. I graduated from Concordia with a BA in Psychology, but quickly decided that I had zero interest in pursuing psychology as my career! I didn’t know what I wanted to do — so I took some time and I traveled to New York, where I started working at an Ad Agency. I quickly noticed I enjoyed connecting with consumers through messaging and data. Understanding how people work and how they interacted with media was a big conduit to my love of marketing. I found I had a good intuition for it; I understood people and their behaviors. 2. Tell me about your first interactions with leaders at work. What were they like? Were they women or men? The leader that stands out the most to me is my first boss at Yellow Pages. There was no “power trip” about her. She was a woman who held a lot of power but she only exercised that power when necessary. She was always available and wasn’t “overstretching” herself by doing so. She was very accessible. This open door policy meant that I never felt uncomfortable asking questions or attending meetings. When I started, she took me to EVERY meeting she had with every department. Because of this I was exposed to the entire company which made me feel more confident. I never felt embarrassed or afraid to ask for information. She was always happy to nurture my talents. She gave me the best piece of advice: “If you think there’s something wrong with the way we’re doing things, or there’s a problem, you can always talk to me about it. But I expect you to always have a solution or two to propose.” I think accessibility is important because it’s a way to attain the full picture. She drew upon her own strengths. It was, “this is who I am”, and she was better for it. 3. Did you have female leaders in your life all throughout your careers? My Mom was a superior court judge. My Grandmother was in the Canadian Army on the Red Cross in WWII. The women in my family are strong. They did not mess around! I’ve been surrounded by powerful women and leaders my entire life. 4. What qualities and traits do you aspire to have as a female leader in tech? I aspire to be innovative in my field and to bring new ideas and methods to the projects I work on. I also aspire to drive results. The status quo isn’t enough, I want to challenge it in the ways that I can. Early in my career I realized how important it is for me to be an agent of change within the company I work for–to spearhead innovation and interest within the walls of my own company. The best compliment that I’ve been given was that I was a leader that didn’t need a title. As for what I would say is a strength of mine as a leader and what I would encourage women to cultivate: My EQ. At 37, I am finally realizing that what has been stereotypically branded as a “weakness” in women is, in fact, my strength. My EQ has made a leader of me through empathy, and an ability to vocalize what my team needs to hear in the way they need to hear it. However, there is a difference between EQ and not being able to keep your emotions in check. One helps you read a room and connect better, the other can make you quickly look like you can’t handle difficult situations. Do I get emotional? Of course, but I have found my ports in the storm that I can count on to support me and let me vent. Since the beginning of time, women have had their tribes – find yours! 5. If you could give one piece of advice for a woman entering tech — what would it be? There’s a lot of talk about how you have to pull long hours, hang with the boys, yada yada. I would say that the truth of it is, if you were hired, you are capable.Trust in that. Know your stuff. Be confident. You know what you’re doing but ask the questions when you don’t. Be humble. Most importantly, FIND A MENTOR! Find someone who can mentor you and move you forward. 6. What can women do to continually educate themselves, rally and cultivate a strong community for themselves within the tech sphere? There are loads of great resources out there, especially now that we are more connected than ever before. Watch the TED talks, read the Twitter feeds. Find what you like and see what’s out there! Follow the media. Network with other women. Start following the community that resonates with you. Is it on Medium, or is it on Reddit? There are so many rich female communities sprouting up everywhere. Go out and find yours and do what feels right to you –start building large, strong communities that reach beyond the boundaries of gender. Senator Elizabeth Warren. I admire her greatly. And I would be remiss if I didn’t say my own tribe of women! They are women that I’ve watched first hand navigate some really difficult things with grace and humour, and become leaders in their own right. I admire them greatly for that. I tend to really appreciate the women that took a weakness and turned it into a win. Whitney Wolfe is the founder and CEO of the dating app Bumble. She left Tinder (and filed a sexual harassment suit) in a flurry of negative press about how she couldn’t cut it and chose to channel that into her own, incredibly successful, venture. And all while hiring and supporting women both within the company and within the construct of her app. 8. Where do you hope to see the state of women in tech in 10 years? I would like it to stop being revolutionary that there are strong “women in tech” so we are just able to celebrate “tech leaders” regardless of gender. 9. Do you think that equality has been achieved in the workplace for women, or is there more to do? I think we need to keep doing what we’re doing. Keep going to school, keep getting the education, keep getting the roles. I’m really optimistic that the next generation will think it’s even MORE ridiculous that we have this gender divide. 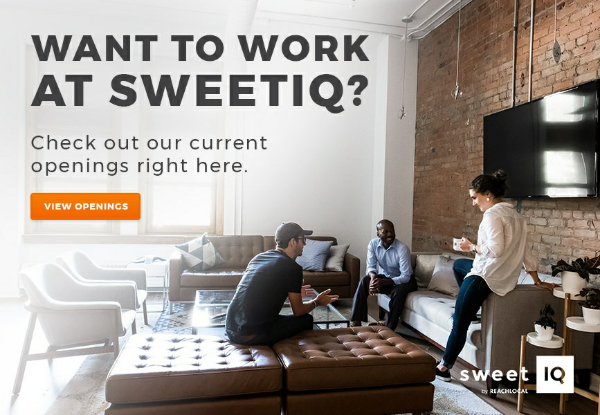 Want to work with Liz at SweetIQ? Check out our current openings right here.